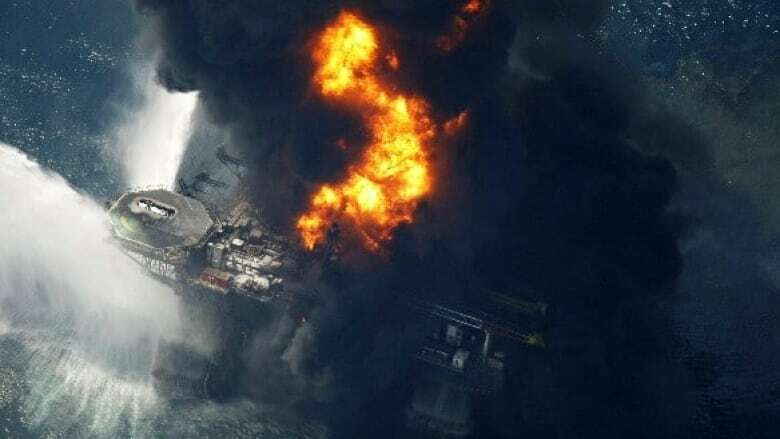 An oil rig off the Louisiana coast has sunk into the Gulf of Mexico days after an explosion tore through it, as the search for 11 missing workers continues. A total of 126 workers were aboard the Deepwater Horizon rig when the explosion happened Tuesday, sparking a massive fire. Seventeen workers were taken by air or sea to hospital and four are in critical condition, officials said. The rig was about 80 kilometres off the Louisiana coast, officials said. The coast guard sent two cutter ships, a helicopter and a plane to help with the search for the missing workers, officials said. Rescue workers said the hope is that the missing workers made their way to fire-resistant enclosed life-rafts. Adrian Rose, vice-president of rig owner Transocean Ltd., said crews were doing routine work before the explosion ripped through the rig. He said the explosion may have been a blowout, in which natural gas or oil forces its way up a well pipe and smashes the equipment, but officials still haven't determined exactly what caused the blast. "I've seen a lot of things, but I've never seen anything like that," said a visibly tired worker, who declined to give his name, as he got in a car to leave with a woman.